Introduce yourself / Hello from Moscow, Russia! My name is Alex, I'm 32 years old. I live in Moscow, I drive motorcycle for more than ten years. My first acquaintance with Gymkhana was in August 2013, it was located at "Signalny proezd 17" and it was a small court (about 20x40m) with one tortuous track on it. A little bit later, a small simple track was added for beginners. This court was held every Wednesday and had attracted 20-25 people. In September 2013, we had closed that court and I began to hold Gymkhana on another place - "Yaroslavskoe shosse 54", it was twice larger than the previous one - 35x60m for main court, plus 15x20m for beginners court. It was also held every Wensday and there were 30-50 bikes at the peak time. Season 2014 was marked by a large number of visitors and we had opened two more courts - near "Timiryazevskaya" subway station and on "Lipetskaya" street. The feature of "Lipetskaya" place was the point-style track - like a Japanese Gymkhana. They were hold every Wednsday and Friday for Timiryazevskaya and every Sunday for Lipetskaya in addition to Yaroslavskoe every Wednsday - of course, when there is no rain. In the season 2015 we had closed the Lipetskaya place because of expandation of the local carwash, and my friends went to Yaroslavskaya, and I began to hold Gymkhana at the new place - "Leningradskoe shosse 73" on every Sunday. It is the biggest place - 70x55m for main court, 20x40m for beginners court and simple figures, and 30x55m for children court, and it works the most long time - from 17:00 to 22:00. FIVE HOURS OF FREE TRAINING EVERY SUNDAY!!! In the season 2016 the Timiryazevskaya place became a paid parking(((((. A large area near Third Circle Way with exellent asphalt and without road markings became nothing - people don't want to park their cars there. Therefore, at that moment new road junction was opened at Ryabinovaya street, and there was very good asphalt under the bridge, so we replaced Timiryazevskaya with this new place. SO What about sports competitions?! Our regular Gymkhana events attract more than 1000 new people every season and make dozens of hi-class sportsmen. We hold amature Slalom Test with simple, but large point-style track. 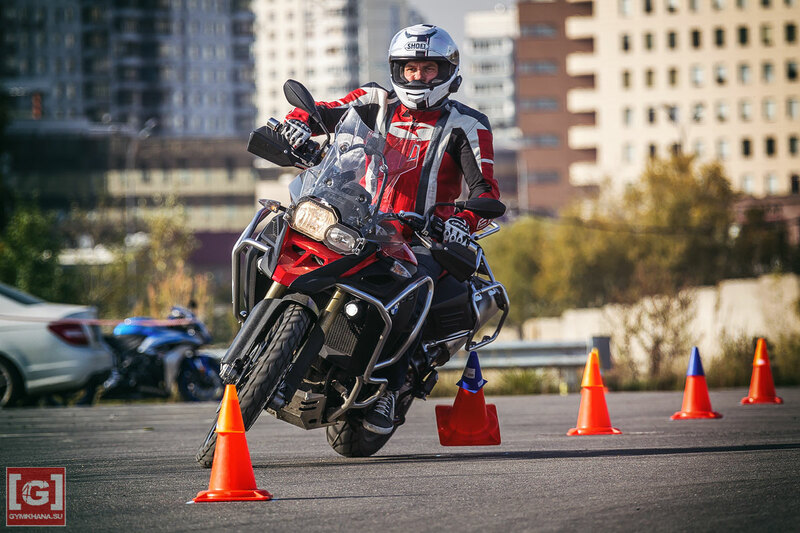 Three winners in every class (roadsters below 700, roadsters above 700, enduro and motard, cruisers and tourers) are banned in the next Slalom Test. We use hand-made timer with IR-laser, based on Arduino kit. And we hold our big Sports Competition named G-RSBK together with Rissian Superbike competitions. So that's how we make it!! !